Antique Reproduction and Traditional Style Table Lamps for bedroom, reading and living room lighting. 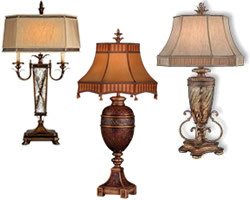 Antique Reproduction Antique Style Table Lamps are appropriate for many historic and traditional interiors. This collection of Table Lamps includes options with natural materials to coordinate with the Adirondack, Arts and Crafts, Craftsman Style and Lodge Style as well as elegant options to coordinate with Hollywood Art Deco style. This collection of lamps in stained glass with organic patterns or thematic styles that reflect the delicate lines of the Art Nouveau style. Blue and White Table Lamps are a traditional favorite for many interior styles. Traditional Ming blue and white landscape patterns with pagoda and tree detail, Chinoiserie-inspired lamps in styles with a Ginger Jar body, Urn, Tea Caddy or other oriental inspired table lamps in a variety of sizes. The clean look of traditional Asian transferware is a timeless favorite. There are three pages of Contemporary Table Lamps. Table lamps are a mainstay of residential lighting. Typical contemporary table lamps have a heavy base to hold the bulb and a paper or fabric shade. Shell, glass or mica shades can also suit a contemporary home. There is tremendous variety available in shapes, colors, patterns and textures in contemporary ceramic table lamps. Shades can taper or have straight sides and can be opaque or translucent. Ceramic table lamps are available in a plethora of designs. Contemporary wood table lamps have a heavy wooden base to hold the bulb and a paper, fabric, shell, glass or mica shade. They are available in a wide variety of designs to seamlessly fit into your interior. Coastal Living with these Table Lamps that incorporate driftwood, shells and coral or reflect ocean motifs. Star fish and coral Table Lamps work with a variety of interiors from contemporary to cottage. Eclectic table lamps made of stainless steel with 3 mm tubes that can be twisted and stretched in every direction. Van Teal offers a wide variety of contemporary and eclectic table lamps made in the United States. These unique designs, innovative shade treatments and colorful acrylics that are works of art. These Table Lamps fit in with a modern interior. Clean brushed steel, chrome and glass in modern style for form and function. Small scale table lamps to fit into your modern or mid mod interior. Ultrasleek sensibilities or unusual eyecatching sculptures. Efficient lighting or conversation pieces, these table lamps are on a smaller scale. Oriental Table Lamps add Asian elements to add to any decor. Asian influences in lighting with the oriental feel of rice-paper and delicate glass shades. Japanese style drawing influence from Shoji screens. Bamboo can also add an Asian feeling to your interior. Chinese is often more opulent, Japanese more restrained with deceptively simple forms. Modern or Contemporary interiors are complemented by Asian inspired table lamps. Rustic themes and motifs bring a rustic decorative touch to any log home, cabin or northwood lodge-themed room. Mica diffusers, leather wrapped shades combine with pine cones and needles or horse, trout or other motifs. Or choose rustic finishes on a more contemporary lamp. Traditional Table Lamps for bedroom, reading and living room lighting. Traditional Table lamps are appropriate for Americana, American Country, Century Traditional, Colonial, Decorator, Delft Early American, English Country, Formal Country, Formal Traditional, New England Country, Swedish and Cottage style decorating. Transitional Table Lamps for bedroom, reading and living room lighting. Bedside Table Lamps are usually smaller than living room lights. Three-way sockets allow for comfortable reading light or ambient room lighting. Transitional Table Lamps are appropriate for Contemporary, California Style, Casual and Classics style decorating. These lamps feature a USB port built into the base that allows you to charge your electronic devices. Some also have a power outlet built into the base. These swing arm lamps, table lamps and desk lamps in a variety of styles will coordinate perfectly in any style home, a perfect example of style and function. Get the feel of a crystal chandelier with a unique portable table lamp. The Encased Gems Collection features clear or multi-colored faceted crystal gems set like jewelry. Traditional, contemporary, romantic and even eclectic, crystal table lamps work in many interiors. 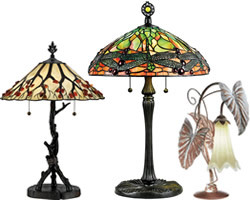 This collection of Table Lamps is handcrafted from genuine art glass in various hues in Tiffany Style. Table lamps in a variety of sizes with either glass shades, bodies or columns. Glass table lamps are a great way to add a pop of color, balance a room or anchor your design. These reproduction lamps have the look of an antique oil lamp with a glass chimney, designed to protect the flame even in high winds. They are the lamps you see in antebellum scenes in movies and art work. These table and floor lamps are ideal for your outdoor living area. Just plug in to have light where you need it when you need it. Specially made to stand up to outdoor use. Spotlights with cord and plug. A practical lighting solution, without any hardwiring. Choose an unobtrusive portable spot light for some of the effects of recessed lighting. Use them on the floor to uplight a wall, on a table or desk to light a picture, or on top of shelves to graze a ceiling. Easy to use, easy to move, these are a great lighting option! These Desk Lamps combine form and function to coordinate with a variety of historic inspired or traditional interiors. Desk lamps provide bright, direct light for a specific area. The classic desk lamp is a metal light with a deep shade, an angled stand and a flexible arm that can be adjusted to many different positions. Modern and Contemporary desk lamps can be cantilevered to provide task lighting for your desk, bedside table or other area. 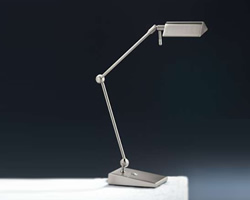 Holtkotter's most popular reading lamps can be adjusted for any application. Coordinating wall and desk models are available. Available with a side-line dimmer encased in a precision-milled housing with a retracTable cord. Wall models have a pin-up kit available. Piano lights that rest on the surface of the piano, clamp on or sit on the floor, these are perfect for lighting music for pianos. LED battery operated options options for concerts. Lecturn Lights are portable or designed to be permanently installed. The Around the World Collection has a wide variety of portable table and floor lamps. Chrome and painted finishes combine with white diffusers and other colors to work with modern or contemporary interiors. This collection of Table Lamps mixes a choice of colors with smooth chrome finish to coordinate with a variety of interiors. These Portable lamps combine finishes and colors with a natural shape to work with an urban eclectic contemporary interior with a rustic edge. This collection of table and floor lamps combines modern linear shapes with a variety of contemporary finishes and colors. A wide variety of contemporary table lamps and a coordinating torchiere. This page collects Floor lamps and Torchieres that coordinate with various Art Deco style interiors. There are two pages of Contemporary Floor Lamps. Free standing floor lamps help to raise the general level of illumination as well as provide local task lighting for reading or other activities. Whether you want to add another element to your eclectic interior or have that one statement piece in a clean slate, this collection of floor lamps really stand out. orchieres range from 60" to 72" in height. They typically diffuse light upwards and provides reflected indirect light. This collection of floor lamps offer a variety of choices for lighting your modern interior. Combining effective lighting with minimalist modern sensibilities. A little less historically influenced that antique reproduction lamps, these floor lamps slip comfortably into a traditional interior. This lamp type, which ranges from 60" to 72" in height, typically diffuses light downward and provides ambient or task light, as an important design element in the room. Transitional Floor Lamps are appropriate for Contemporary, California Style, Casual and Classics style decorating. These unique crystal lamps add the feel of crystal at eye level. Beautiful finishes with crystal accents. These stylish and efficient floor lamps provide task lighting. Torchieres range from 60" to 72" in height. They typically diffuse light upwards and provides reflected indirect light. This page has torchieres from a variety of styles, including Antique Reproduction Styles. Free-standing wet location rated fan can be used outside next to your chaise lounge, to the pool, in your patio table in place of your umbrella or anywhere you need a cool breeze on a hot summer day. The two table top fans are a throwback to classic desktop fans.